Denna produkt ger dig 2990 bonuspoäng. Självavlossande vagn typ Fad 50 Ootz DB, längd över buffertar 37 cm, epok III. Model: The car has hinged unloading hatches on the sides. The minimum radius for operation is 1,020 mm / 40-3/16'. The couplers can be each be set in 3 positions for length. Length over the buffers 37.0 cm / 14-9/16'. Prototype couplers are included. Prototype: German Federal Railroad (DB) type Fad-50 Ootz high-capacity hopper car with transition lettering. 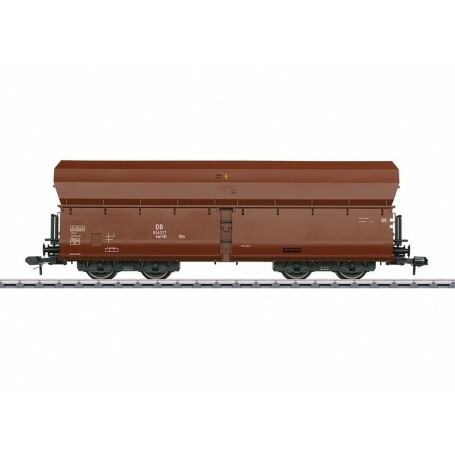 Used in unit trains for volume freight service with coal, coking coal, and ore. Car number 614 217. Working unloading hatches on the sides.